Last week’s post about naval and maritime graves in west Wales got a very positive response, so I thought I’d return to a similar theme this time. I spent the second half of last week further north, on the shores of Cardigan Bay, dodging torrential downpours, visiting a few places of naval interest (both expected and unexpected) and doing some research in the National Library of Wales at Aberystwyth. As I think I’ve said before in these blogs, the latter must be one of the nicest study environments anywhere in the world – where else can you sit at your desk and look out over a glorious vista of sea, hills and a medieval castle? (My runner up would be the library of the National War Museum of Scotland in Edinburgh, where you can get a stunning view over Princes Street, the Scott memorial and the Firth of Forth to the hills of Fife – but only from the gents’ loo…) It turned out to be a really productive session, perhaps the best discovery being the autobiography of a Victorian seaman from Aberdare who provides some fascinating information about naval life in the 1870s and 1880s. He’ll be one of the ‘stars’ of Britannia’s Dragon! 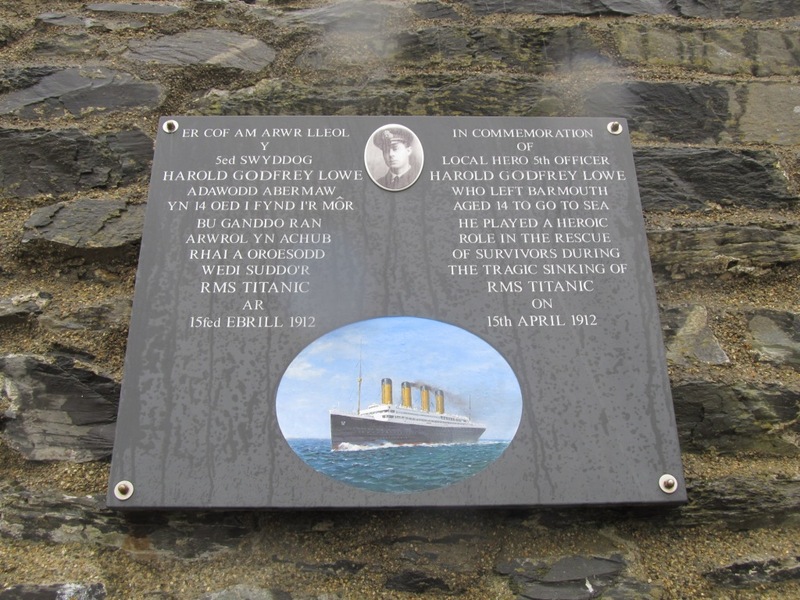 Other ports of call included Barmouth, where I arrived during a near-monsoon; diving out of the car, I got a picture of the new memorial to local man Harold Lowe, fifth officer on the Titanic (played, appropriately, in the film by fellow Welshman Ioan Gruffydd!). Lowe was an officer in the Royal Naval Reserve during World War I and was aboard HMS Suffolk in Vladivostok in 1919, during the Russian Civil War. There’s a good account of this, and of his life as a whole, in Inger Sheil’s new biography of Lowe. The other intriguing naval memorial that I came across was in the somewhat unlikely setting of the church of St Peter ad Vincula (‘St Peter in Chains’) in Pennal, near Machynlleth. 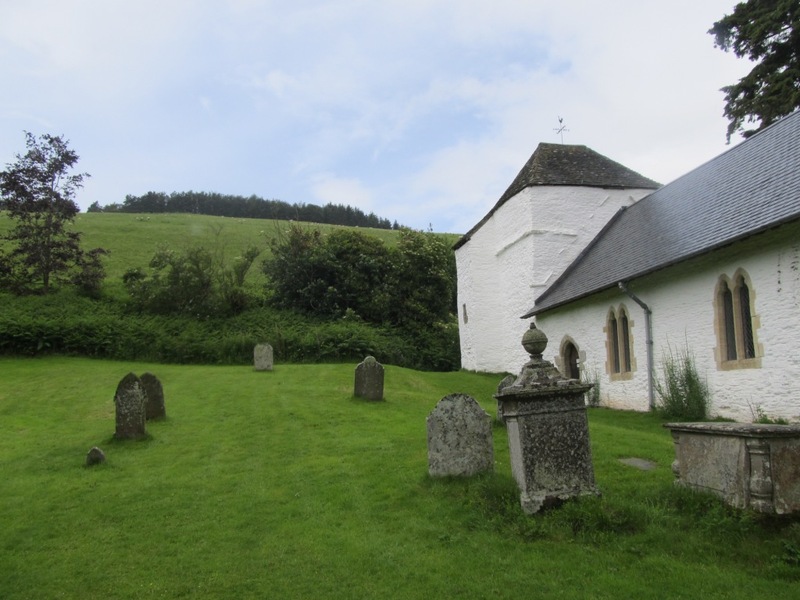 Pennal is a tiny village now, but it was once a really important place; the church was a chapel royal for the Kings of Gwynedd and then for the Princes of Wales, including Owain Glyndwr. Indeed, Glyndwr held his second parliament here and signed the ‘Pennal letter’, a document asking for recognition and support from the King of France. 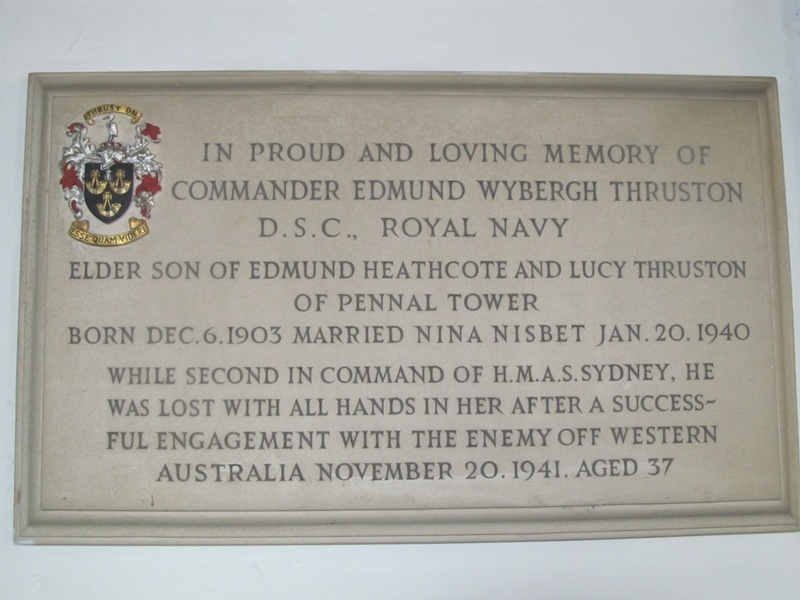 But on the wall of the church is a memorial to Commander Edmund Wybergh Thruston, Royal Navy, second-in-command of the cruiser HMAS Sydney when she encountered the German raider Kormoran on 20 November 1941. The Sydney won the engagement but was also lost during it, and for decades her fate was a mystery and a source of considerable debate in Australia. Finally, here’s one of the places I visited on my way home: the tiny, ancient church of Pilleth, near ‘Offa’s Dyke’ and the English border. The hill behind it is Bryn Glas, and it was here, on 22 June 1402, that the Welsh army under Owain Glyndwr fought and defeated that of Edmund Mortimer. The mass grave of those who died is still marked in the churchyard. Mortimer defected to Glyndwr’s side and married his daughter, a story taken up by Shakespeare in Henry IV Part I (which coincidentally I studied for A-level and which has just been given a brilliant new treatment by the BBC, first broadcast last weekend). Shakespeare called him ‘Owen Glendower’, and that name was used twice by the Royal Navy – firstly for a frigate built in 1808, which distinguished itself in anti-slavery operations off the African coast, and secondly, without the ‘Owen’, for the training base established at Pwllheli in the second World War (perhaps better known in its later incarnation as a Butlins’ holiday camp!). Both HMS Glendowers feature prominently in Britannia’s Dragon, but the very fact the name was used at all is surely pretty remarkable, and must partly be due to his appearance as a character in Shakespeare. Maybe one of the readers of this blog can provide evidence to the contrary, but I don’t know of any instance of, say, the French or Spanish navies ever naming warships or important shore establishments after the leaders of failed Breton, Corsican, Basque or Catalan independence movements. Even the United States Navy, which has had no difficulty in naming warships Robert E Lee and Stonewall Jackson (albeit only once in each case, 100 years after their Civil War), has baulked at naming one after Confederate President Jefferson Davis!